Hammonton Health Center Services (formally the Innova Health Care): This special service is held every 3rd Sunday of each month starting at 2:00 pm in the afternoon at the Hammonton Health Center Facility located on the White Horse Pike in Hammonton. Come join us as we minister to our senior citizens in message, song and prayer sharing the “Good News” of our Saviors Love. Hammonton Health Center Visitation Service (formally the Innova Health Care): Held on the 3rd Tuesday of each month at 3pm in the afternoon. This is a ministry to individual residents with song, bible reading and prayer time. Men and women join in serving in the wonderful ministry. Men’s Fellowship Breakfast: All men and teens are encouraged to attend the meeting on the 4th Saturday of each month starting at 8:00am downstairs in the Fellowship Hall. A delicious Continental breakfast is served followed by a devotional and prayer time. Special outings occur as planned. Ladies Auxiliary at Camp Haluwasa: This program is held at Haluwasa Christian Camp and Conference Center located at 377 South Ehrke Road in Hammonton on the 2nd Thursday of each month starting at 10:00am. A light breakfast is served and a devotional and craft time is followed by a “Pot Luck Lunch”. 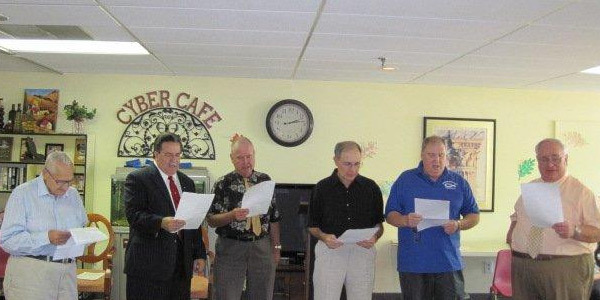 Keswick Hymn Sing: This outing is held on the 1st Thursday of each month at America’s Keswick in Whiting, NJ. A buffet Continental breakfast is served followed by a hymn sing that includes favorite hymns and choruses, both contemporary and traditional. A delicious hot lunch is also included. Transportation is provided by the church with the van leaving promptly at 8:15 am. You must sign up beforehand and is open to all adults. The cost is $10.00 per person. Please call the church office at 609-561-6867 if you’re interested in going. Join us for a truly uplifting time in song, testimonies and fellowship from the Colony.